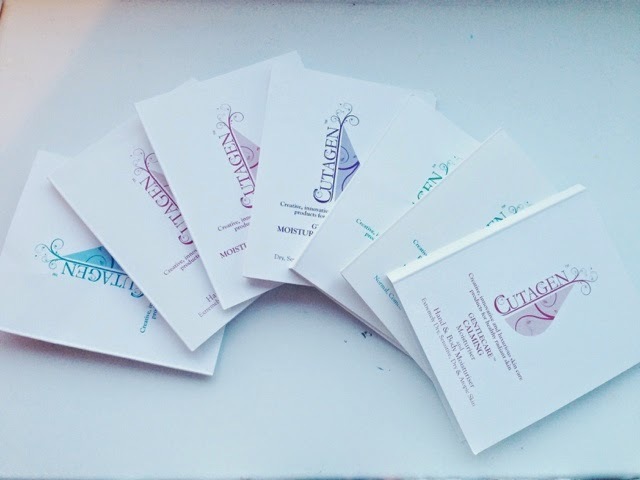 On Twitter a new UK skincare company called Cutagen were looking for bloggers to try out their products and I was kindly sent a few samples by the lovely Caroline. I have always suffered from dry skin, no matter what I used it was never moisturising enough for me. Whenever I use a hand wash, I end up getting dry skin around my fingers which is just not appealing! And sometimes it can be really painful as the skin gets thin and cracks. 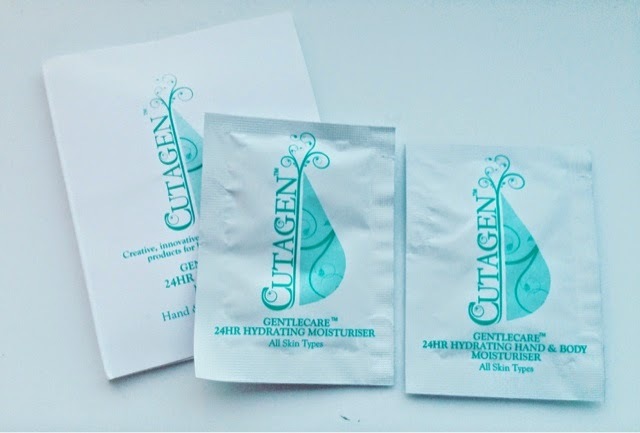 Firstly a bit more about Cutagen..
"British skincare brand Cutagen was founded in 2011 by Dr. Rizwana Alvi, a medical microbiologist with 15 years in the biopharmaceutical industry, and Dr. Faizan Awan, a medical professional with eight years in hospital medicine and General Practice. Cutagen applies scientific knowledge to create exclusively-formulated products with ingredients proven to deliver benefits for skin. The cosmetics can be used by everyone, even people with complaints such as eczema, acne and psoriasis." So as you can see I received these samples and I took the pictures when I received them so I could show you guys an example of my package and sample sizes. I have used these products for over a week now and to be honest I have managed to get two uses out of each of the sample products. I really liked the hand and body washes as they were moisturising and not drying as I find with many different hand washes. My body and hands did feel really clean and refreshed and that's what I really loved about them! I like how they have colour coded their products - so they recommend; red for extremely dry skin, purple for moderate dry skin, sensitive, normal and combination. Green for all skin types and blue for sensitive, combination and oily skin. I think this code helps to find the products you need to suit your skin type and it shows that they have made products to suit each and one of our needs. I really do not like the smell of the product! If one thing that puts me off from using something then it is the smell and I am sorry to say it is not something I am too keen on unfortunately. I found it really confusing how some products said 'Gentle care 24hr hydrating moisturiser' and the other one said 'Gentle care 24hr hydrating hand and body moisturiser'. I looked through the ingredients list and there was no difference between the two so maybe it is just the packaging. But it seemed to confuse me a lot! Overall I think I will be purchasing a full sized hand wash as I do find it difficult to find something which suits my hand as I always get dry skin from using normal hand washes. The scent is really the main issue for me however I also do understand the reason behind it being perfume and colour free is to suit sensitive skin. The products price range from £4.99 to £9.99 which makes this brand fall into the affordable skincare range. If you would like to make a purchase you can do so on their website. Link here. Use the code DV10PC to receive 10% off your orders. I do not make any money from my readers using this code, it is just to help you guys save some money! Disclaimer - I was sent these sample products to review. This is my honest review and for more information please read my PR/Disclaimer page. Good review. I don't mind products that have a nice smell otherwise I just get put off!